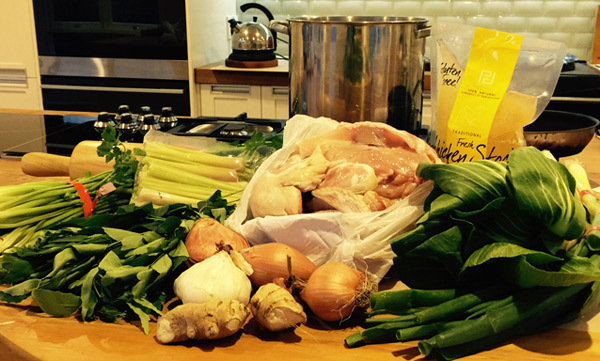 Nothing beats homemade Chicken Soup for flavour or personal satisfaction when the job is complete. You use nearly the whole chicken including, yes, including the feet! The feet add a depth of flavour not achievable through simmering the carcass alone. 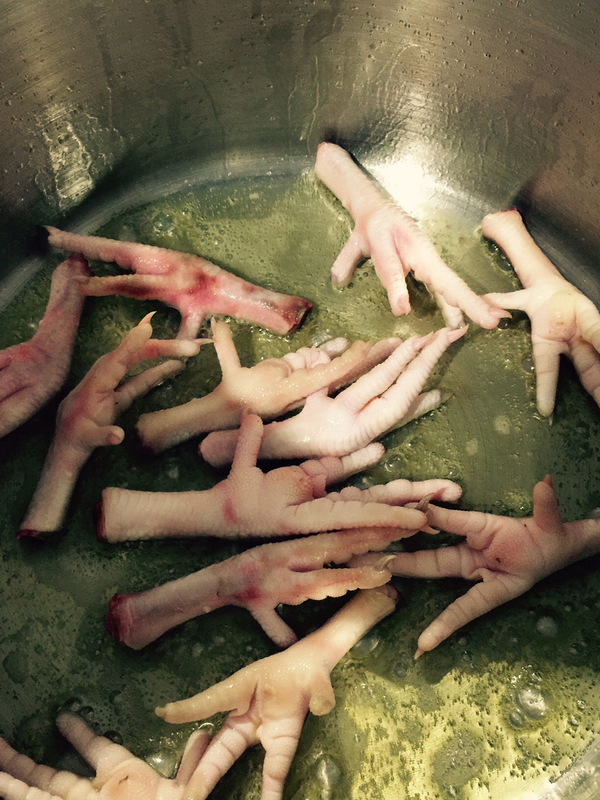 If the thought of chicken feet in your soup is too abhorrent then purchase a dozen chicken nibbles or wings and substitute them instead. Use a nice deep pot for this brew. The chicken feet crackle and spit when they’re searing so I use a crayfish pot which accommodates the whole delicious stock concoction nicely. Try this recipe and see if you notice a difference. 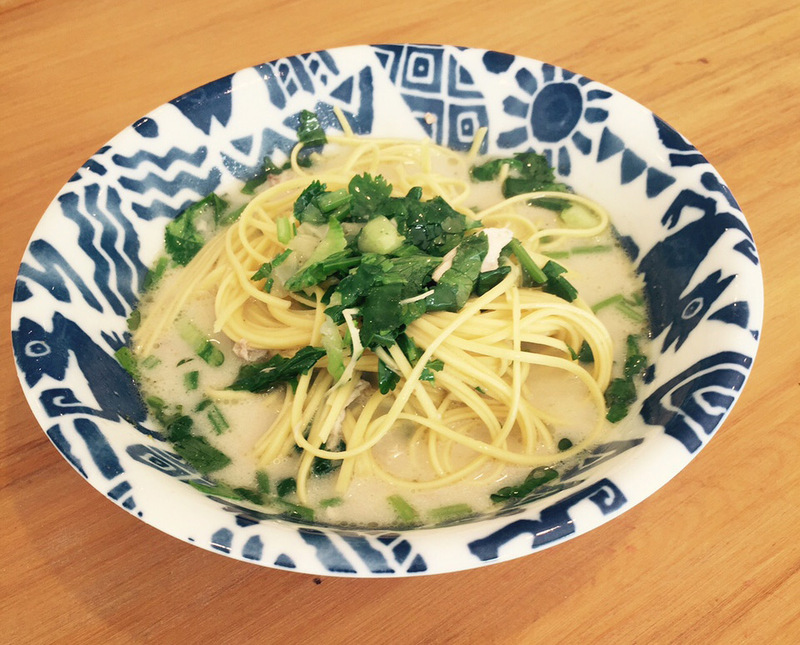 The resulting broth is rich and lite with a sticky depth of flavour and a lovely clean finish. Add loads of fresh Asian Greens and herbs and the perfect Chinese soup noodles and you have a rich yet lite, satisfying, life-giving meal. Two stalks of Lemon Grass split down the middle and bashed about a bit. 1 x 300ml can coconut milk or another cream if your body gives you permission. Sear off the chicken feet in a little butter and oil until they are browning up. Add the chicken frames and sear for 10 minutes. Add the ginger, garlic, Kaffir leaves, Lemon Grass, Garlic and sear further. Add Lemon juice and chicken stock then the rest of the ingredients, with the exception of the whole chicken. Season with Sea Salt and freshly ground black pepper. Add the whole chicken and just enough water to cover it. Put the lid on the pot and after ten minutes turn the heat down to simmer. Simmer until the meat of the whole chicken is falling off the bones. This will take around 40 minutes. Remove the whole chicken to a platter to cool til you can extract the yummy meat. Give the bones to your cat who will love you for them. Reserve the meat, cover and refrigerate. Drain the remaining stock and veges through a large sieve into another large pot. Use a potato masher to extract every last bit of goodness from the vegetable slurry. Allow the stock to cool and then refrigerate overnight. The next day you can remove any excess fat that has settled on the surface of the stock if you wish. *Note – you may want to freeze a quantity of the stock at this point depending on whose Army you are feeding! 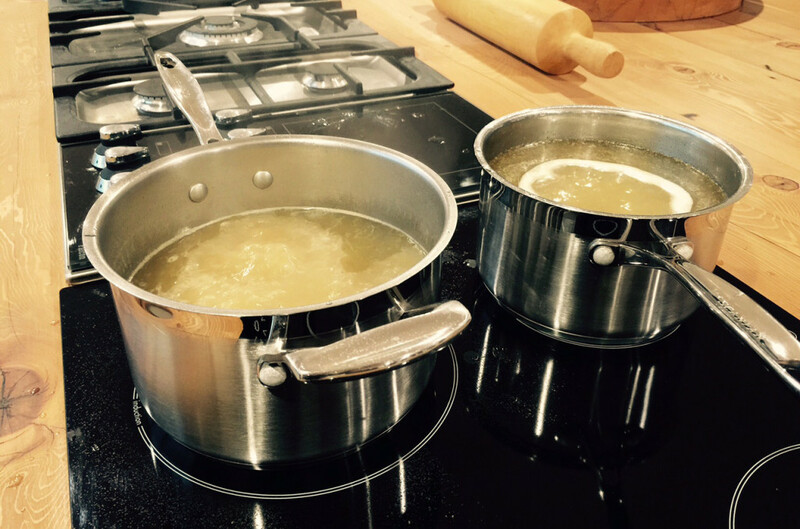 Reheat the stock on a brisk boil to reduce the quantity by half. Now add loads of fresh chopped Coriander leaf, Pak Choy leaf, a little extra crushed Garlic, Ginger and finely diced red chilli. Add the Coconut Cream and milk. Depending on your stock quantity, you may not want two cans here. Taste and season. Your reaction should be “Wow!” If it needs a little Zing, add the juice of half a Lime. Add your noodles. Simmer gently for ten minutes. Lastly add the shredded chicken meat. It is important not to add the meat too early or it will go to mush. 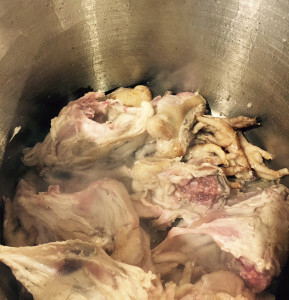 Leave the meat quite naturally chunky, as it is if you gently extract it from the chicken carcass. Simmer until the chicken meat is hot and the noodles are cooked. 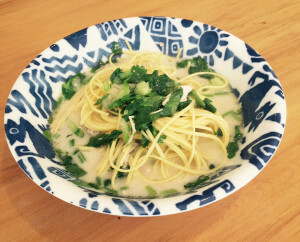 Extract the noodles first and place in the centre of a wide soup bowl. Add the meat component on top then ladle the exquisite soup broth. Add a generous handful of chopped, fresh Coriander leaves to garnish. If you are not such a Coriander fan then Parsley will suffice here.